Time to update your studio equipment or just starting out? You'll find all the studio supplies you need here. 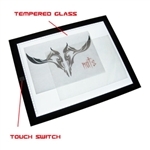 Our light boxes come in two different sizes, and provide a perfect light source for tracing your tattoo designs. Well-built and reliable, the light boxes come with the appropriate power connection for your area. With an easy touch on/off touch, hold the switch steadily for varying the brightness amount. Duel ruled edges make accurate measurements a breeze. Lightweight yet durable, the Superior Thermal copier accepts A3 and A4 paper, has an adjustable darkness setting and operates in either photo or mirror mode. Ultrasonic cleaners are a must for studios, and ours are available in two different colors. Thermal paper, 4 piece 100 sheets to a box, can be used by transfer machines or by hand. We offer different arm rests, there is one ideal for you or your operators, with expandable height capability, chrome-plated legs with rubber tips, and oversized arm rests in black.